*Increase the "currency" of LT—the sense that LT isn't just for static catalogs, but includes currently-reading books, discussions, local events, recommendations, etc. *Provide a "home page" for signed-in members. Right now, some users treat their profile as "home," others their catalog. The former is bad because most of the info on it is static and already known to you. The latter is bad because it walls you off from the rest of LT.
*Provide a jumping-off point to the different parts of the site. *Provide a "news" page, both for you—connections, local, talk—and for the site generally—movers and shakers, ER books available, etc. *Make the page customizable, so members could focus on what they care about and ignore what they don't. At the same time, it's critical that it draw in newly-signed-up members, and that the default settings are good for most members, since most members don't change defaults. Now PLEASE understand this is an early draft. It is a thinking tool. It's not finished or set in any way, from features to design. This also means that I'm interested in constructive criticism, but uninterested in attacks on me, the team and LT in general. Blocks. Each "block" has an edit pencil at the top right, when you scroll over it. Depending on the block, various options will be available (eg., you can show 5 or 10 Connection News items, from all connections or just friends, etc.) Either there or another way the order and placement of the blocks will be editable. Recently added. I find this a good "where-was-I-last" feature. I think it will be either supplemented by or optionally replaced with "Currently reading." Adding "Currently reading" info to the page is a major part of this effort. Connection News. Right now, this is showing all connection types and all events—ratings, reviews, additions. It is amounting to a sort of "friend feed." I am thinking of making it a true one, so that you also get updates when members join groups, mark that they're interested in LT local events, etc. Certainly it will show when people put things on their currently reading list. LibraryThing Local. I hate that this can't be in a better place. It will probably get some bookstore photos to make it pop more. Just added to LibraryThing. Needs a "refresh" link. Early Reviewers. Should be personalized more, so it says that you've requested X books, etc. Featured Author. My wife will not be the only featured author. Talk. I'm unsure what to show here. The talk page is its own "news" of a sort. Perhaps it will show the last X messages in your groups that are unread. Currency. As stated, this is about currency. It ties into larger efforts—collections, because collections include "currently reading" and that makes people feel like LT is alive—and email notifications—because some members want to get updates on their friends, recommendations, etc. through email. These in turn are vitally involved in a code project—taking things out of the database and putting them in active memory whenever possible. I've been wishing for a feature like this for a long time. Are you at all thinking of adding RSS feeds for the different info blocks, when applicable? The idea is that the various blocks are windows into other parts of the site. In some cases what's there now exceeds the live site (eg., the Connection News provides an amalgam that is not possible elsewhere), but this should not be true when it goes live. So, in some sense, that's a separate question. Generally-speaking, I favor RSS feeds, but I've grown wary of feeds that require development, lots of calculation time and get used by nobody but the Technorati bot over and over again. RSS is an edge technology for most web users, even now. Sweet, I'm an edgy housewife! Along with the proposed Talk block might there be a place for New Groups? Early Reviewers - Maybe a list of the authors that are hosting a chat thread? I'm sure I can think of more, and I'll be back if I do. Otherwise I like the start so far. This looks great overall. Movers and shakers will be particularly interesting. You obviously know what my main complaint is. I'm not sure I'll even use currently-reading, since I prefer permanent data to temporary data. I imagine that people who read very quickly would be even less likely to bother with it. I agree that showing most active talk threads would be useful. It would be especially good if we could specify a few groups whose most active threads we were particularly interested in. You know I love it Tim. And I like the idea of adding a link to Author Chats in there. My initial reaction is that it looks very cluttered. Does "customizable" mean that we would be able to eliminate enough of the blocks to give the page a clean and simple look? Of course, my next comment is going to involve more stuff! How about a "featured member" or "member library of the week"? Oh, and what about featured reviews? I really like it (and I'm sure there will be much further haggling over the specifics, but I love the overall idea). - Instead of most active talk threads, how about new messages in my groups? - I like the upcoming author chats idea. - I was just about to agitate for local events, but then I saw it down there -- yay! I tend to forget local since it feels like a whole separate sub-site. - I've been wanting Just Added back since that tantalizing day when we had it on the home page. Yay again! - Can we look at other people's home pages and not just our own? That seems so much less static than most profiles! I like the suggestion about starred threads. I know there are concerns about privacy that have been discussed before, but I'd like to see what member "x" has posted recently. Member "timspalding" immediately comes to mind. Were's the obligatory weather widget? Minor point - do you need the Profile subnav with the Profile tab just above? The rest of the subnav are at least two clicks away (aside from Home itself), so they're useful. The 'admin stats' link looks interesting (yes, I'm a stats geek!). If Early Reviewers listed _which_ books I'd requested, that would be more useful/interesting than _how_many_. And if they stayed there for a little while after requests were completed, so I could wishlist the ones I didn't get, that would be _great_. Personally, I'd put a Talk box in the center column rather than Connection News...and yes, that should be covered by the editability. And if it can show which of your groups has new messages (maybe a sub-box on top or on the side?) that would be wonderful. Currently I check Bug Collectors, New Features and Recommended Site Improvements every time, and it would be very helpful to know if there's anything new in there - the Your Groups list is always filled up with Green Dragon and SF Fans posts, so I can't see anything. I do look at those groups, but they're not the ones I check every time. Zoe's suggestion about selecting which groups to see threads in would work too. BTW, Zoe - I do read quickly, but I like Currently Reading - I read several books at a time and sometimes forget about one. I'm not using the CR checkbox (because it doesn't do anything) and usually enter the dates after I'm finished - but I do tag my books CR when I get on LT between starting and finishing them. Overall, looks great! I usually come to the site from the blog Live Bookmark (another use for an RSS feed (I think)) or hit the home page and immediately jump to Talk. (and then to my library or profile to check for comments - assuming I'm not coming on to add or check books). With this for a homepage, it would be worth coming to it every time and using it for a centerpoint - which is what you're aiming for. You succeeded, for me. ETA - would the 'you have a comment' box show up on this page? It doesn't on Talk, which means if there's a lot going on in Talk sometimes I don't see a comment for days (too busy with the social side to go to my own library or profile). Admin stats is daily signups, money, top referrers. Alas, it is not publicly available. See http://www.librarything.com/talktopic.php?topic=38423 for more on "Friend Feed." 1. I don't think the two links to "Profile" are both necessary. Personally I think that with this feature I would hardly ever go to my profile again -- the only reason I ever go there now is if I have a comment, or if I need to get somewhere currently accessible only via the profile, like Recommendations or Members with Your Books both of which are here now. 2. The inconsistent sectioning confuses me -- why are headers for the two columns on the left boldface with a horizontal rule while the rightmost has a light blue background, no boldface, and no line? 3. Will the Early Reviewers section be changeable, to indicate that a new batch is available or that recipients have been selected and we should check our profiles? 4. I can see that newbies might be confused by the similar names for "Recently added" (your books) and "Just added to LibraryThing" (sitewide). Maybe "Recently added by $username" for the former? There's room for it. 5. As it happens, since I haven't convinced anyone to join LT, I don't have any "friends", just "interesting libraries" -- thus I would have zero interest in Connection News becoming a "friends feed". I don't really care if someone whose library I find interesting plans to go to an LT local event in Boston or Seattle or wherever they live, or that they've joined a new group. It's strictly a library-based interest. Perhaps different levels of involvement for "friends" vs. "interesting libraries", if you do decide to expand it? 6. Any reason why Connection News gets book covers, and none of the other sections do? It seems unbalanced. 1. I'm not sure if messaging will be moved off the profile. I like the idea of messaging as a "wall" feature, not an "email" feature. Being shown to all by default is part of that. 2. Yeah, the idea is that the right is global stuff—LT stuff, not about you. 3. I think it should be. 5. Good. See other thread. I want that feedback. Anyway we could highlight "thumbs ups" reviews? With the chatter on encouraging quality reviews of late, it might be nice to be able to see when you recieve a thumbed-up review. It would also be nice to see which reviews you've thumbed up. These wouldn't be the full reviews, but perhaps when folks notice they have 50 thumbs-ups and have only given out 2 themselves, they'll be more mindful to give a quick thumbs-up the next time they read a good review. But I do like a changing homepage! I was thinking that the new link was to the profile page of whoever's home page you are viewing (assuming that you can view someone else's home page). Maybe this could be called "Recent activity", with links to several alternative displays: Recently added, Currently reading, Recently finished, Recent Reviews, etc. In addition to what is already planned, this would give members the ability to jump to books they have recently read (to update tags, for instance) or reviewed (to update the review or examine flags/thumb-ups). I know that this can be done elsewhere, but it seems to fit in with the basic concept of this section. Oh, I like the idea of having a section for the most recent thumbed up review (of mine) or even site wide. If it's the home where's the sign in? Currently reading would be great! Recently read would be better because it would include a wider range. Unlike _zoe_ in #6 I love temporary data and am quickly bored by permenant data. However as an aforementioned fast reader I'd like to see some history here. By blocks do you mean the dark blue headers? Or just the light blue stuff on the right? or both? It does look cluttered currently, but with suitable tweaking I'm sure LT basic clean design that is so user friendly will shine through. >21 reading_fox:, this is home for signed-in members -- presumably, if you're not signed in (or after you sign out) you see something more like the current home/sign-in page. >21 reading_fox: I agree, I like recently read. Currently reading is too ephemeral - too many people finish a book in a day. This will be a great new feature! Man, I wish I wasn't at work with a million things to do before the end of the day so that I could read all the comments and participate. I like the general idea of having a lot of information accessible (and up to date) in one spot, BUT I want to echo lilithcat in #9 because the current look also seems cluttered to me. As she asked, will we be able to customize by removing blocks that aren't of particular use to us? >21 reading_fox: I think we're actually in agreement here. When I said I like permanent data, I didn't mean I want to see the same permanent data all the time, I just meant I wanted a permanent record of all the previously-new data. I think Date Read provides that; the information at the top is constantly changing, but the old information is still there if you ever want to look at it later. I want to third or fourth some way of featuring reviews. Whether they be most thumbed, recently added, whatever. I think it'd be nice to have a review a might not otherwise read on my front page. I think the advantage of having currently reading for MY page is that its easy to access the book when I'm finished to rate, tag, review, change status, etc. However, if I'm looking at someone else's I'd want to see a few recently read as well. >21 reading_fox: : If it's the home where's the sign in? Good point. No, it's the signed-in home page. Many sites do this. The "home page" is for outsiders, but you get a central page to launch out from. Note that this is just your page. You won't be able to look at others' home pages. The page will contain private info—eg., it will contain actual info even if you are a private member, etc. Yes, removing blocks is certainly necessary. I'm very very tempted not to allow it for a month or so, so I can get members to agree on the best "average" look. How about a Tag Watch block? For example, I'd like to see the 10 most recently added books that have been tagged with "linguistics". #28: I love the tagwatch block. It would bring back some of the functionality I've been missing with my tag mirror not working. #10, 18: I really like the featured review/thumbs idea. Maybe "my reviews | reviews I've thumbed | most-thumbed reviews" where most-thumbed reviews would let me see popular reviews of books in my library. #9: I agree the interface is cluttered. I like the right-hand column of LT-general information, but I find the user-specific "blocks" hard to read. I was expecting them to be more widget-y, I think: that is, graphically separate (with their own edit pencil) and, ideally, re-arrangeable on the screen. Maybe they could each have their own (tan?) background, so the whitespace didn't blend in with the right-hand column? #7, 8: I like "most active," "starred," and "most recent (unread)" for talk threads. I'd also like the Author Chats group singled out in its own block - similar to Featured Author. I really would like a featured review as discussed here. 28: Or recent combinations, separations? Definitely. My current LT "home page" (where my bookmark points) is the tag combination log. I'm willing to consider that. You CAN see recent books added to a tag, though. Check out the tag page. But I'd want it in that central location home page thing. I really like linguistics. ;) Also, I might like to change the chosen tag when I get a new interest, like "paisley" or "ostriches". And I really hate bad tag combinations. Yeah, but isn't most of this a collection of information we can see elsewhere? Right right. Sorry. I thought you thought that'd be a new feature. My first thought: sign-in page? Oh, yes I forgot that it is possible to sign-out. Really! I'm with #32 in that I use a bookmark (or actually an access-key link from my webpages, but the idea is the same) and jump directly to my catalog. From there I go to either Talk or Add Books, but some things are very many clicks away and I would use a LT home page many times a day if it provided easy access to all of these. I wonder if you are packing two things in one bundle? A personal homepage and a sitemap? Not that I'm saying this is a bad idea, since I've seen several requests for a sitemap since I joined LT, but maybe it should be two pages rather than one? How about a link to the users wiki-page? Right now I often go: Jump into catalog view, click Profile, click Wikipage, click sectionheader to jump to relevant section of wikipage, click on the link to the relevant subpage and click on edit. It would be nice to be able to save a couple of those clicks. >40 bnielsen:, I'm with you on skipping past the home page, although I jump straight into Talk. When I do go to the front page, it's a moment of "oh, yeah, this place...." But I think the new home page will not only be something useful as the old one isn't, but will completely replace my need to ever look at my own profile. Stolen from someone in another thread, I'd like to see who has recently read/is currently reading the books that I've recently read/am currently reading. series watch or author watch? customizable/removable blocks so I can make it as cluttered or as spare as I want...I do like piles so my home page would probably be cluttered. here's a new one...how about a couple of drop down boxes loaded with links to selected favorite authors or series from my catalog. This might even be a catalog page thing. Currently I use folders on my bookmark toolbar in Firefox 3 to keep lists of links to author searches (to show the books I own) in my catalog. I would really love to do that within LT instead of on a tool bar on my browser. These things would make me want to bookmark my home page rather than go directly into my catalog like I do now. My initial reactions: Very interesting, DEFINITELY long-overdue, but probably won't use it much anyway. ... I can't help it, no matter how awesome it turns out, I'll always be that person who jumps into the site to get down to business, basically flying over the homepage. 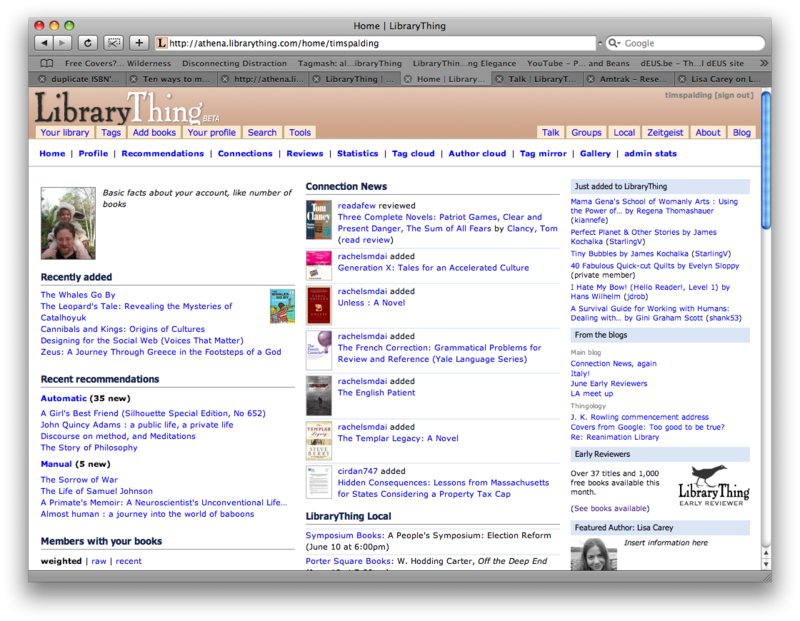 I'm thrilled an inviting home page is about to become reality here at LibraryThing. As always, thanks for your hard work, Tim & Company. My initial reaction to the page is, as others previously expressed, as being too busy. You want the home page to entice newbies *inside* rather than flood them with overwhelming in-your-face options of what to do. We need some clear navigation system here. That system should be the focus of the home page rather than the minutiae of LT content. Yay for a home page! I'm way excited that this feature is being developed and can't wait to see it implemented! I'd really love a "Recent activity" sort of feature that showed which books we recently started (based on the start date), which books we recently finished (based on the end date), which books we recently reviewed, etc. Currently reading could be pulled in as a sort of Facebook-type "I am ________." So it would say, "Amanda is currently reading ________ by __________, _________ by ____________, and __________ by _________." It would pull all the information from the books marked with the Currently Reading box. A recent activity list would take the last ten items that saw activity (started, finished, reviewed) with a link to see the history further back. And then you could have a wants to read box as well that pulls the books marked with the "To Read" box (so it would say, "Amanda wants to read:" and list all the books on my "To Read" box). I sign out every time. (habit. Most of the sites I use where there is a sign in also have a log out that is important.) I would be happy with almost anything that shows up when I sign in if it really shows up quickly. Right now I get a message that the page isn't available about 95% of the time, and the rest of the time my catalog starts to load, and sits there loading, loading, loading... until I hit 'add books' or 'groups'. I like the concept of and many of the ideas covered for this private home page. I like the way it gathers up many things of interest in various LT places and serves them up in one place for me. I can only see it pleasing people if the ability to customise or drag and drop the items each member wants to see. As an LT author, I'd like to be able to get some material from my LT author page in there - maybe my author links - any chance of making this possible for LT authors on the home page? I like it. Once I've added a book to my library, I get bored with it, so this is a little bit more dynamic. I would like a search box. It seems to me that on most sites you don't have to navigate away from your homepage to search. I'd use LT more as a jumping off point to look at stuff in amazon etc. if the search page wasn't all tucked off by itself. And it would be interesting if you could customize what the page showed--although probably really difficult to code? Once I've added a book to my library, I get bored with it, so this is a little bit more dynamic. Have you tried sorting your catalogue by a more dynamic column, like date started or finished? I find that what I see in my catalogue is constantly changing. Tim, I think the new profile page looks great. One suggestion I have is to create a place in the profile where we can keep a list of books that are TBR. I know that people have suggested we do it with tags in our library or use an Amazon wishlist - but there are those who only use LT to catalog books they actually own and prefer to keep all of their information here on LT.
>48 crashingwaves38: I'd really love a "Recent activity" sort of feature that showed which books we recently started (based on the start date), which books we recently finished (based on the end date), which books we recently reviewed, etc. Tim has elsewhere expressed his reluctance to base this on reading dates (as they are an infrequently used feature of LT). If he were to expand the planned Recently added/Currently reading feature to include "Recently finished," he would probably do so using collections (you add a book to a special collection and it appears in that category), rather than dates. At least, that seems to be his current plan. Tim -- if you take the collections approach to Currently reading or Recently read, is it possible to have an autofill feature? You could set the number of books to put in the collection and it could fill it based on reading dates. For those who don't use dates, they could add the books to the collection in the normal manner... A possibility, perhaps? It seemed like he was planning to keep track of track of currently-reading dates separately from the date fields: My opposition to caring about the date-read stats is often stated. The answer is to note when a book is put on a currently-reading list, which is also coming, but not coming immediately. That seems a bit redundant; I think it would make more sense to link currently-reading to the dates that we already have, with the option to opt out. I agree that autofilling collections based on dates would also be useful. The two things should certainly be connected in some way. >57 SilentInAWay:/58 I always see the date issue as a chicken & egg thing. Few use dates now so features aren't based on them, yet if key LT features were based on dates, probably more people would use them. It seems to me that a feed of currently reading and/or recently read books would get a lot more people interested in using the date features. I would also assume that the way the date features work currently would need to change so that they're easier for people to use and therefore would feed more data into the stream. Seeing what people with similar libraries to mine are currently reading or have recently read would be - for me - a great feature because it would give me more fodder to add to my TBR pile. About Currently Reading being a Collection...This seems to be based on Tim's belief that Collections are just like tags, but books that are being currently read just doesn't seem like a distinct enough group to be made a Collection. Of course once they have the feature people can make anything they want a collection, but I'd rather not see Currently Reading become one of the default Collections. if key LT features were based on dates, probably more people would use them. I've seen several people say that they started using the date fields just in the brief time when they were connected to Currently Reading. At the risk of reviving a long and well-worn debate, not everyone wants to use the date fields, or to have them auto-populated. I don't use them (partly because of lack of time, partly because I don't have complete information, partly because I don't see the need to share that information with others, and partly because I don't read all books in a way that is amenable to start and end dates). I especially don't want such fields to be auto-populated. Even if I did use date fields, they are logically separate from "current reading" status, since people read books in different ways. The fact that someone is currently reading a book doesn't necessarily mean that s/he starts at p. 1 on day X, reads linearly, and finishes the last page on day Y. Some people read some books that way, but not everyone reads all books that way. I'm fine with auto-populating being an option, not a default (should the LT staff choose to develop it), but I don't want my library to start including data I didn't explicitly choose to put there. I'd still like to be able to take advantage of any future "currently reading" feature to group my books, without having to use date fields. On topic: I like the dynamic, personalized homepage idea, and I'm fine with the proposed look. I would second those who have suggested the option to customize which parts of it we see. I also might like to see more information from my profile, such as my groups, my main tags, a link to websites or "also on" - or have the option to display some of that information. But that's a weak preference; I'll keep using my profile page for some of that if it's not incorporated here. Another feed suggestion might be books recently tagged X, to match some of a person's favorite or most common tags: but that would probably only work if it was customizable and optional to display. The problem is that from "not everyone wants to use the date fields", it's concluded that "essentially no one wants to use the date fields and therefore no one should be able to do anything with them". Whether auto-populating should be opt-in or opt-out is a pretty minor issue that could easily have been resolved months ago and left everyone generally satisfied. But there was absolutely no effort to reach a compromise, and instead Tim abandoned the date fields entirely. The issue keeps coming up because the current state of affairs isn't satisfactory. The difference between filling in dates and a "currently reading" checkbox is vast. A checkbox is simple, it's one click on or off and it doesn't require anyone to stop and go, "did I start this last Tuesday, or was it Friday - or maybe I should say Saturday since I really only read through the intro on Friday...but if I could enter an -ish date, that would be great..."
I like this new front page, I'd really hate for it to become stagnated because we have to have dates work for a small number of people in a "meaningful" way. ETA - I know this will be responded to in a "well, you obviously hate dates way" with a counter that explains why I should love dates. I don't have to love dates. I won't love dates and I won't be browbeaten into loving dates. It should be accepted that reading dates are VERY fluid to some people. I don't sit and read books straight through most of the time - nor do I read a single book at a time. Dates really don't matter to me. >63 rsterling: Actually, I completely agree with you. Even though I personally love using the dates, I was one of those who disagreed with the idea that the check box would autopopulate dates in my catalog. I would love to see two check boxes: Currently Reading and Recently Read. That way there could be a feed to my new, personal homepage from the people I have marked as interesting libraries (and hopefully also the Top 50 similar). I know very little about programming, but it would be nice if the feed would stop either when a.) the user unchecks the box or, b.) after a certain number of days from the time the box was first checked. So, if someone marked a book with Recently Read box, it would be a part of my feed for X number of days after they first checked it, then it would go away. And, FWIW, I would prefer Recently Read to Currently Reading. Too many people on LT finish a book in one day, so Currently Reading would be like a blip on the feed. Personally, I will continue to use the Date Finished box to keep track of when I finish a book. I have only just recently started using the Date Acquired field and may or may not continue. However, I don't want to use the Date Started field and I would not want it to be autopopulated. >66 stephmo: I also really like the new homepage idea and want it to go forward as soon as possible. Even if, to start, it doesn't have a feed of Currently Reading/Recently Read, it would be a wonderful new feature on LT. I think the reason I've personally been talking about the dates is because I know that I would spend even more time on LT if I had a feed of Recently Read books either from my Interesting Libraries or from my Top 50 Similar Libraries. I would be clicking on titles to read reviews, checking out what else the author has written, and perhaps engaging in conversation with the LT'er who recently read the book. And like I said in #67, I think check boxes are the way to go to make it quick and simple for people to use. I think the dynamic homepage will only be visible to the user her/himself. At least that's what I thought I understood. Maybe it would also be possible to incoporate some more dynamic elements on the profile page - and that's where I think a kind of widget displaying my currently reading or recently read would be cool. On dates & categories: I'd like both a "recently read" and a "currently reading" category. I'd probably use date finished sometimes if I could record YYYY and/or MMYYYY instead of the exact date. >66 stephmo: I hope you didn't feel like I was browbeating you. I know a lot of people don't care about the dates. I just see dates as a tool to get to something more interesting - to see what people have been reading lately. >70 Talbin:, No I didn't. I've just seen the path before and I'm bracing myself for it, so my apologies if I seemed overly sensitive. I feel like I've seen the dates offered up lately as a sort of cure-all to everyone's cataloging problems. The idea that we'd suddenly have this minable data if everyone started using dates is nice, but when you depend on individuals to input fluid data...well, you're getting data. Just because you can do stuff with it doesn't mean that you'll get anything meaningful. You can convince yourself it's meaningful, but that's about it. ETA - I realize I just opened the can of worms with meaningful. In real life, I work with data. Just trust me on anything you have to run data on that's based on user-inputs. I've done more than my fare share of analysis on self-reported items. The clusters you get will pretty much tell you, "this is when the person remembered they were supposed to fill out the form for self-reporting and/or the basic time their supervisor reminded them that they had to fill out something." Only in LTs case, there's no such thing as a supervisor. The hope of putting a wiget in that is based on dates will simply mean, "these are the times people looked at their pages and wanted to change something." You can extrapolate that a certain percentage of those dates will be accurate, but it will mostly be, "this is the time someone remembered that they wanted to change something." The thing is, when I'm looking at other people's data on LT I'm more concerned about "interesting" than "meaningful". I don't want new ways to see other people's data so that I can draw brilliant conclusions to revolutionize the publishing world or something like that; I'd be perfectly content with whatever incomplete date data happened to have been entered. I don't think you have to love dates. But I don't see why no one should be allowed to love dates. The problem I have with Currently Reading without dates is that it would be fine if you were interested in people (what is X currently reading? ), but not if you were interested in books (who is currently reading X?). Only the most popular books would be read by multiple people at the same time, and eventually the lists would become clogged with people who had come to the site once, entered their current reading, and never returned. With dates, it would be possible to look further back for fellow readers of more obscure books, and there wouldn't be a problem with false "current" status. I wrote something before reading Zoe's message and realizing I was in fact 100% wrong about the motivation of the date-clamorers; they really do want precise dates, rather than just "read recently". Oh well. Zoe, have you considered that you will have a lot more "currently reading" and "recently read" data to use if you look at the data from those of us who want complete data as well, who are unwilling to have exact dates for a tiny fraction of our library and no dates for the rest of it? As for "looking back farther for readers of more obscure books", why can't you do that now? Look at who has the book and doesn't have it tagged "unread" or "tbr" or "wishlist" or some such. More likely than not, they've read it. Especially if they've rated or reviewed it. >74L lorax - . . . realizing I was in fact 100% wrong about the motivation of the date-clamorers; they really do want precise dates, rather than just "read recently". No, Zoe wants precise dates. "The date-clamorers" (so far I'm counting two of us) disagree somewhat about how to go about it. Take another look at my posts #67+68. Personally, I'm looking for some interesting (to me, but maybe no one else?) dynamic data that can populate my new personal homepage. If that is best achieved with check boxes or collections - great! This is not to discredit what has already been set up, but more my personal views on how I'd like to see a dynamic home page on LT presented. 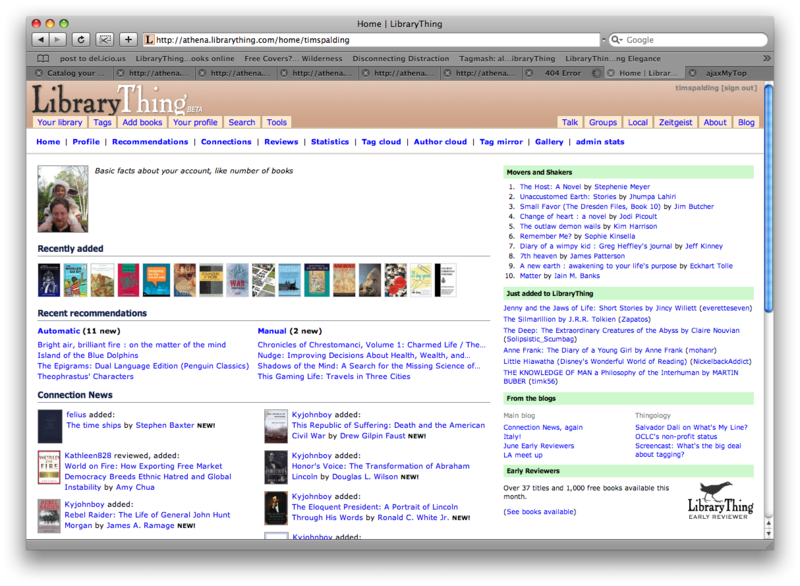 After looking at the new home page above, I realized what I don't like about it is that it is mostly a list of books. I know; I know. This is a book site. However, the entire site itself is largely pages of lists of books. To my way of thinking, I'd rather have the home page look more like a Newsletter. There would be sections with snippets of LT news, hot threads on talk, author introductions, a highlighted local bookstore, etc. These newsy (and dynamic) "articles" would be the lead-in to each of the LT features. I just don't think that a home page should look like columns of lists. I think that's more intimidating than it is inviting. It doesn't have to be Facebook-ey. It can have clean and classic lines (which I'd much prefer anyway). Yes, of course I have. Obviously the best course would be to combine both types of data. People should be able to use the checkboxes/collections or date fields as they see fit, and it should be possible to look at both types of data. Whether someone chooses to add a book to their "recently read" collection or to enter yesterday's date in the appropriate box, it's still recently read. I don't object to Currently Reading and Recently Read in themselves, I just don't think they should be the only thing (especially because they don't currently exist, and the date fields do). Let me repeat, for the millionth time, that I do not think everyone should be forced to use dates or that exact dates should be the only way to mark reading status. However, it does not follow that exact dates should be ignored completely. I feel like I keep seeing the following argument: "Group B shouldn't have to do what Group A wants. Therefore, Group A should have to do what Group B wants." It just makes no sense. Look at who has the book and doesn't have it tagged "unread" or "tbr" or "wishlist" or some such. And how exactly do you suggest I do this? Should I just go to each of the 40 or so catalogues and look for the book there? Plus, just because someone doesn't bother tagging doesn't mean they've read a book. And the whole idea of using one set of data to try to derive a different kind of data when we could just look directly at the data we're really interested in is annoying. I sometimes wonder whether I should just give up entirely and move over to Goodreads. Actually Zoe I agree with you on this %100. I've kept track of my begin and end dates since early 2005 and I see no reason that since I have them that they shouldn't be used ALONG with whatever solution Tim & Co come up with for everyone else. Wow. I just noticed this, and it looks very cool indeed. A home page with lots of interesting and dynamic content? Well, Flickr and Facebook do something like this, to name but two, and it seems to be working for them. I can see that there's already a lot of clamour over exactly what would be most useful on the page, and exactly how it should work. Well, that's fine, isn't it? You've been very non-prescriptive about how people should use this site, in general. So any given home-page widget is going to be useful for some people and less so for others. Make 'em customisable, make 'em things you can choose to show or not, and you'll probably satisfy most of the people most of the time. And you can always add new stuff later on. I am fully down with tracking begin and end dates better. I would, however, like to work them into a more comprehensive solution—one which, I feel, will be more appealing. Right now, without collections, I don't see the value in making a feature that few have or will use and which I will only have to change soon anyway. Right. The trick is finding the right default. To the earlier point about the page being just books, I know what you mean. Talk needs to be there, as does, I think, more author stuff. We were thinking we'd do a featured author, and perhaps authors born on this day, etc. }}Look at who has the book and doesn't have it tagged "unread" }}or "tbr" or "wishlist" or some such. And how exactly do you suggest I do this? Should I just go to each of the 40 or so catalogues and look for the book there? Plus, just because someone doesn't bother tagging doesn't mean they've read a book. Well, I'll admit I was thinking more along the lines of a book held by 10 people for "more obscure"; you're entirely right that for 40 it gets a bit unwieldy. There are certainly going to be untagged books, but I think that for most people who don't use tags, "read" is a reasonable default assumption -- by and large, people enter either books they own or books they have read (I doubt very many people enter wishlist books without either tagging them or having a wishlist catalog indicated as such in the username); even in the former case, most people will have more read than unread books unless they sell books as soon as they finish. Not a 100% guarantee by any means but certainly better than nothing. Any chance for some rotating random stats? The Zeitgeist page is full of them, but could we highlight a few there? Especially things that are tied into new features that could encourage more use of the features? - The highest combined tags (aka - we all spell differently). I dunno, but it might be interesting to see the 150 ways people do their wwii tag. - City with highest saturation rate for LT Local events (healthy competition!). - Author with most mentions in talk for 1 week (although we'd probably need touchstones to be less wonky). - Same thing for book with most mentions in talk for 1 week. - Conversely, maybe a "longest time since someone's mentioned an author or book in chat (currentdate - last date of mention). - Most added book this week. - Most deleted book this week. I can't think of anymore off the top of my head, but some random things like that may be fun. Anyway, I'm happy to hear that start and end dates could be incorporated into a more appealing comprehensive solution, so I won't say anything else on the subject for now. I like the idea of random rotating stats. It would be nice if there could also be a one-sentence summary of the blog post (though this might require a tiny bit more effort when writing the blog post). Instead of just seeing "Italy! ", it would be better to see "more than the usual daily sign-ups and half were Italians! ", so that even without going through to the blog people could get a sense of what's going on. I buy books faster than I read them, too (though not at anything like your rate -- wow, that's impressive! ), but I also have a backlog of read books. So even if in a given month I buy six books and read four, I still have all the books read in the past. My read/unread fraction is shrinking but read still overwhelmingly predominates. A lot of my older books are sadly in storage and haven't been catalogued yet, so I currently have 681 books tagged "unread" and only 471 tagged "read". I've also realized that a lot of the books I read when I was younger are pretty indistinguishable from each other, so I can't actually remember what I've read--there are 71 Nancy Drew books in my catalogue, and I've probably read most of them, but I have no idea which ones, so I can't count any of them as read. Still looking good! Having a few more covers visible definitely brightens up the page a bit. I'd like to see Local given prominence above the fold, possibly instead of "Movers and shakers" or "Just added". Partially because it does take time and effort to keep Local up to date, and reminding people about it will help ensure that this continues to happen. Partially because venue/author pictures will help give the page visual variety. And partially because it's got more direct relevance to the user than the other two sections. I know. It's hard to know what to put higher. Talk is the other thing missing now. I was thinking that maybe Local could go on the right. It's in between being about you and being about not-you. Will we be able to toggle between covers and a text list for the Recently Added section? Will we be able to move the various elements around or not show then, similar to the customizable Google home page? If so, then people could decide where to put their own elements depending on what's most important to them. Or is that too much of a programming nightmare? Have you decided against a review of the day? I thinks so, but see above. I think that you'll be able to set the order of elements, but with only two columns, and with a clear differentiation between their meaning, I don't think you'll be able to do more than that—to make new columns, etc. No, but I haven't really thought about how much work it would be. I think it could be a lot. Could we have a search box with options to search our library, authors, or works? Less options here would be better than more, it wouldn't have to take up much room. Perhaps even a single Search button that took you to a page with the first few results from the various categories. I liked the blue bars much more than the green. Are there really enough basic facts about our library to fill that huge box? And do you really want to fill a box that size with largely static information? 94: Yes, good idea: a search box! Maybe that could fill some of that "basic facts" space. Re: 94 and 96. Search box! Search box! Also, may be a little space for the most active threads in your groups? Also, can a little message show up telling you to go to your profile, because you have a comment? Sometimes I miss comments, because I don't visit my profile. I also don't find recently added to librarything be that exciting, as it doesn't really have anything to do with me. Just because one person adds a book to library thing doesn't mean I am going to have any interest in it whatsoever. On the off chance, I want to see that I can go to the zeitgeist page. I like the movers and shakers though. Is it worth having a link on the new homepage to some of the manage account features and tools currently on the profile? You could maybe just include the icons, with text that would show up if you hover over them. I think at least an "account settings" link (or the little cog-wheel) would be useful somewhere on the page. I also think the "put your library on your blog" is probably an attractive feature to emphasize for new users. Are there really enough basic facts about our library to fill that huge box? That looks much improved. I like it. For a review of the day: What if the home page just showed the most recently thumbed review? That would require basically no upkeep. I'm also throwing in my vote for a search box. Though actually I think there should be one in the header, but that's another discussion entirely. Yeah, the searchbox is a done deal. It's so good the fellow who suggested it should be knighted. I like your idea about reviews, although I shall withhold a knighthood for now. I like the idea of showing the most recently thumbed review. Yeah, it's a good one. I'll play with it. 100: Any chance we could have the messages notice in the header of talk? Please? If you knight rorrison for suggesting a search box in message 94, you should also knight Katissma for suggesting the same thing in message 54. 102: Or the earliest thumb of the day; maybe alternating between noon and midnight to prevent overvoting? ...while others, of course, must obscure in toiletry. 1 - definitely feature recent thumbs-up reviews. 2 - users should have some control over which modules they want to see. 4 - I'd much prefer a list view for recently added. Personally don't find the cover view that helpful in most cases. 5 - is it possible to present statistics on how many users have visited your profile and/or looked at your catalog? It would be an interesting stat, I think. 1. The featured reviews section I have going is based on the last 100 thumbed reviews. I take those, sort any that were thumbed more than once in the last 100 to the top, and then sort by recentness of thumbing. It seems to produce good reviews. 2. Yes. Agreed. It may go live without such control, because I want people to argue strongly for what they want. From that I can decide the *default*. 3. Yes, I'm not sure it will go live with it. It's very hard to know what to show in this module, and the db queries are slower. 5. No. We've discussed this one before. I think it's an invasion of privacy, generally. Are they Your recently added, or recently added to LT? It should say. Either way why? I know what I last added, and I'm not that interested what someone else added to LT.
To get any use at all from me the homepage needs dynamic information on it. If most things haven't changed since yesterday I'm unliekly to look at the page at all. I don't add books every day, or even every week, and I don't think my library recieves much in the way of reccommendations either - very unlikely to change daily. The changing reviews would be good. Random Zeitgeist stats would be good. 112: There's areas for both you and the global LT community changes. Most of the page is devoted to things about you and your catalog but there is a column on the right side (so far) that is devoted to changes on the global scale. And having a list of your 5 or 10 most recent additions may be quite helpful to some people since those are the ones you are most likely to want to see/edit in depth. If you make all of your edits as soon as you enter a book then that module may not be useful for you. The plan is to have all of the modules be customizable and optional on the home page. As Tim said, that may not be functional when we first go live with the page. Yes please. I'd like to see a representative sample of threads with new messages that a) I've posted to, b) I've starred, or c) I've partially read (in that order). I'm much less interested in new threads than threads I've already started reading. I'm not sure how to choose which threads of each type to show. How is it an invasion of privacy to see how many people, not who, have visited your profile? Especially given that no one but you can see your own home page. I'm confused by this as well. I was thinking of counts only, not actual usernames. I think some LT users already do something like this on their profile pages, using embedded HTML counters, visitor maps, or the like. 1. Thanks, Tim. I'm excited about the reviews! 2. Of course, I'd like to have some control...but I'm not too worried about it. Seeing modules I wouldn't necessarily have chosen just means more opportunities for serendipitously discovering cool things on LT.
3. Please, please can we some talk functionality on the homepage? The talk page is currently my LT home page, and I'll certainly get a lot more use out of the home page if I can see, say, the 5 most recent posts in my groups or something. But that's just personal preference. 4. Since I got most of my core cataloging done, my adding has been more along the lines of "oh, that looks interesting" or books I forgot I had...so seeing them doesn't bother me. Besides, it's pretty. But I am wondering: will we be able to access the edit page from these covers, or will they just redirect to amazon or whatever. 5. I don't really need another website that feels like a popularity contest: trying to make more friends, or get more hits to my profile, or whatever. But that probably says more about me than about the feature. I'm not worried about the privacy, but I do think a beginning user, or just a not very social one, would not appreciate a feature that repeatedly reminded them that no one had visited their profile/library. Mostly, I just don't like the idea of members obsessing over whether people are visiting their pages, and feeling crushed because nobody did or cheered (even though it was a Googlebot, not a person). It seems fiddly and nosy somehow. Very un-LT.
>118 monarchi: point 5. Right. I agree. 119: I very much agree on your middle paragraph. I used to belong to a certain blogsite with automatic counters and I hated seeing that no one had visited my site recently. It didn't even matter that I made the blog for myself, not as a friend-tool, it still provoked bad feelings. Ohhh a Talk module, yes! I would really like a "new posts on my groups" module; the Talk page doesn't do it for me, because it lists new posts on ALL groups, unless I click on "Your groups." One of the things I regularly go to my profile page for is to access my groups. Another vote in favor of having comments show up here; if this is to more-or-less take the place of the profile as the go-to page, the things I go there to look at every day need to come here. I mean the comments themselves, not just the "you've got a comment" box. After all, other people don't really need to read my mail! On the subject of reviews, I'd be most interested in seeing other people's reviews of books I own, or (even more!) reviews of books that have been *recommended* to me. Reviews (even excellent ones) of books on subjects outside my interests in would not be something I'd want to have shoved at me. I do like the idea of having the recommendations feed here. I also like the blog feed module. I frequently check the blogs. The random Zeitgeist statistics sounds fun, and I also liked the tagwatch feature very much, especially if we get to pick the tag! I'm glad to see there will be links to the profile pages on this page. I am particularly interested in being able to quickly access things like Statistics and Series Coverage, which I look at often. I know that sort of thing has an important place as part of the profile, but they are also pages I use frequently. Will this be the page that we get after logging on? A mildly irritating thing about the site is that the log-on defaults to your catalog, which loads very slowly if your collection is at all large. I usually hop straight on through to either Add Books or my profile without waiting for it load, depending on what I want to do that moment. Thanks for the hard work, Tim - I'm looking forward to this going live! It looks very nice! Just on your first point, whenever I select the Talk tab I just see my groups because LT remembers that I was using Your Groups the last time I visited that tab. Doesn't it remember for you? What I'd really like (re: new messages in my groups) is to have a listing, on the home page or in Groups/Talk somewhere, that shows which of my groups have new messages. I have four or five that I check regularly, and (because in Your Groups they're completely drowned out by Green Dragon and a few others) the only way to check is to actually go into them. I don't need to see _what_ the messages are, just that they're there. There's a list of My Groups on the right side of the page when I'm in the page for any group - if that had the names of groups with unread messages bolded, I'd know right off if there was anything I hadn't read in New Features or Name That Book (for instance). (and yes, I'd have to go and mark read all the old threads - but that would be a one-time task and after that there would be current information). If that listing was on the homepage, I'd _love_ it - it would supersede just about everything under the Talk tab (welll...I'd still check My Posts every once in a while). >124 jjmcgaffey: I feel like this is something that should be incorporated in Talk itself. We should be able to view Talk by any subset of groups that we want. I have the same problem of some of my groups outpost ing less prolific groups. Simply bolding the group names that do have new posts would be enough. Comment-notifications will show up, but not the comments. LT uses a "wall" model of comments. By default, comments are public. Personally, I find it very interesting to read what other people are saying to each other. It gives you a sense of which members are active. Anyway, you can make your comments private if you want. Reviews (even excellent ones) of books on subjects outside my interests in would not be something I'd want to have shoved at me. I know. I'm torn on this. I think others feel differently. That's about what we're going to debut tomorrow (sometime). I don't know if much is going to change before then, as I have a bunch of work to do for the upcoming American Libraries Association meeting, and Chris gets weekends, maybe. Very interesting. I'm glad that this is nearly ready to go live. Not sure about the default order. Need to play with the actual version but this looks pretty good. You did a great job of incorporating features requested by members. I can't wait to try it out. I'd still like the Talk section to be something more than just mini-Talk. Preferably it would show the most active threads in a few groups of our choice. What is going to be editable on the personal Zeitgeist? There are some helper-type stats there—like CK facts added—but it looks like nothing combination-related. I hope we'll be able to have work, author, and tag combinations (and nevering) show there. This looks really interesting - unlike a lot of similar site homepages, it looks like it might actually be something I'll use. No, it always defaults to All Talk Topics, and since most of my groups are low traffic, they are swamped, as jjmcgaffey said, by Green Dragon etc. I really like this idea a lot - it would help immensely! I would like to see the recent additions (global). I'm interested in what other people happen to be reading/cataloging etc. looks yummy~ I can hardly wait ! Without using it, I actually think the blog should be up much higher. They're going to be updated more than ER, for example. I can't wait to test it out for myself. Yeah, I agree. Chris made that one, and I think he doesn't think about combinations as much as some. (You'll notice he gave CK, his feature, prominence!) Anyway, we'll add that. Yeah, but ER needs more prominence overall. It cannot, I think, ever rate a tab, so it needs to be "sold" somewhere. Since it has some stats--which book is on top?--and some graphics--covers--I think it's more compelling than the blog entries. I'm interested, but at least for now I want the home page to be mostly a "window" into areas of the site, not to introduce new functionality. I very much agree with the user who said that it would be cool to Talk slicing by groups--showing you what groups had new messages, so that people in Hogwarts aren't innundated and unable to follow any other group. Yeah, the idea is that we'll make whatever modules people would want. (Okay, that's the *theory*. Some things are harder than others!) For example, there's no reason why we couldn't have a Combiners! module or something special for author-picture flaggers. But they're not going to be default modules, for sure. As far as the blog and so forth, we need to reserve a little space for LT-stuff, so that your "daily me" has a little "daily us" in it too. For starters, I'm looking forward to putting announcements in the announcements area, not up at the top left, which will be reserved for really important alerts. Here's a shorter, punchier screencast. I'll blog it with this one. I need to master the punchier screencast. Even this—3:56—is too long. The key is to write a script and then do the actions separately. I cut it almost in half just doing that. I actually enjoyed the slower paced one more but a lot of people will like this version as they are more used to the fast, zip thru it kind of 'cast. All the really necessary info is there. Just saw the YouTube bit. It's good, quick, to the point and informative. I like the way the homepage seems to be coming along. I think the version shown in the YouTube video is a good version. It seems to have a good mix of "My" LT stuff and "Us" LT stuff. I think it's becoming, more and more, something that I'll use. I'm going to push it over the next hour. Your mileage may vary—there's a lot to push! All that being said, I love the idea of the homepage. One thing I would suggest off the top of my head is that the announcements on the upper right and the blog info on the bottom right appear to be redundant. Ditch the first and move what's at the bottom up to the top. (As it appears all the announcements go in the blog anyway, no?). I'm not sure. At first, I want the announcements at the top. There's a place for one-sentence messages. The top-left is good for about four words. The blog is good for 4 paragraphs. Hey Tim, Great Job! I was completely surprised when I came to LT, and it loaded up my new home page! Overall, I think you did a great job balancing everyone's suggestions. Two things. First, the ? and the edit icons seem to bring up the same thing. Is that intentional? Second, I really personally dislike the "on this day" box. I'd much rather see the blog box be pushed up to that spot, and the "on this day" box be saved for when the modules are selectable. I don't know--I think it sticks out like a sore thumb compared to the rest of the info. Actually, I was just telling my husband that the 'On This Day' box was going to be my favorite thing on the page! So, what does everyone else think? Oh, here's the blog post about it. It's probably due to my being "change averse", but I don't much care for it. Who are these people in the "connection news" and WHY should I care about the books they're rating? WHY should I care what's "popular this month"??? What possible difference could it make to me what various random people have "recently added"? What makes a review of a book that I likely have zero interest in "Hot"? The only stuff that's on the new home page that isn't "something that I don't care about and don't particularly want to have cluttering up my screen" are what were on my typically open LT tabs: my Profile and Talk/MyGroups. Well, except for the Zeitgeist numbers, but are those suddenly going to be updating more than twice a year? Sorry that you put so much effort into this, but it's a huge step into the worst aspects of all those horrible MySpace/Facebook sites. It makes me feel like Junior High has come to visit! I disagree BTRIPP. but to each his own. I used to use my profile as a homepage, now I will use this. 150: "a huge step into the worst aspects of all those horrible MySpace/Facebook sites." I really disagree. I hate those sites too, and I think that Tim and co have been very responsive to a range of members who provided feedback on the homepage work-in-progress: both those who vehemently didn't want LT going in a myspace-type direction (see the extensive discussions about the friend-feed), and those who wanted the homepage to be more dynamic. This new home page is also completely private to you, which is a major difference from the social networking sites you mention. The new page works more like a feed aggregator. Ultimately, everything on the homepage will be customizable, so you can remove everything you don't find useful. I'm also not all that interested in what's being added to LT in general, popular reviews for books I don't own, etc., and I plan to take a lot of that stuff off my page when it becomes possible to do so. Disinterest in some of the LT-global stuff is interesting, and will be taken into account. We certainly reserve the right to set aside a space for announcements, and ER and LT authors will be there by default anyway. But if members aren't interested in the top books, etc. They can be demoted or moved off the default. "Who are these people in the "connection news"...?" More than likely, these are just the people currently listed on your profile as "Members with BTRIPP's books": Connections include the 50 most similar libraries to yours (i.e. people who share your books) plus anyone you've marked as a friend, interesting library, anyone on your private watch list. Can we move this over to the main thread? 153, "if members aren't interested in the top books, etc. ": hard to say. I'm not really interested in these, but I really doubt I'm representative. I remember this being something that other members had been suggesting for a long time for the homepage, way before the more recent discussions, and I also remember some people liking the list of recently added books that was tried out on the old homepage for a short time. Right. That's what I was going on. Of course, the existence of demand doesn't mean others don't vehemently oppose the idea. I find the recent books interesting insofar as you KNOW those members are on at the time. So you can bother them about the book and be confident they'll see it! The only thing I don't like is I keep clicking the damn search button when I want to refresh talk!